The Robert Beinert Prize, awarded to a a graduating Senior for excellence in Mathematics, to Joshua Danis H'14. The John S. Klein Prize, awarded to a graduating Senior to recognize excellence in Computer Science, to Erxin Du WS'14 and Nicholas Schmidt H'14. The Catherine Adele Rippey '35 Prize, to a William Smith senior to recognize excellence in Mathematics (extended for 2014 to include excellence in Computer Science), to Erxin Du, WS'14. The Glenn M. Lee Prize in Mathematics, awarded to the Hobart senior who has been most proficient in the areas of mathematics and athletics, to Michael Green H'14. The Abigail Mosey Book Prize, awarded to a Hobart or William Smith Senior for generosity in helping others to learn and appreciate mathematical ideas, to Joshua Danis H'14. The William Ross Proctor Prize, awarded to the William Smith Sophomore who has achieved the highest rank in mathematics in her first two years at the Colleges, to Siyan Tao WS'16. 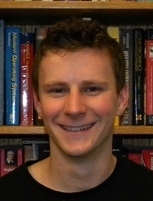 The Irving Bentsen Prize, awarded to the second year student at Hobart College who has the most outstanding record in mathematics and computer science, to John Remmert H'16. Two students completed honors projects in the Department of Mathematics and Computer Science during the academic year 2013–14. An Honors project is a year-long endeavour culminating in a long Honors thesis and an oral examination by a committee of three examiners. Michael Green '14 did Honors in Mathematics, working with Professor Yan Hao. His honors project was titled "A Mathematical Model of College Friendships". Here is Mike's description of the project: "We are creating a computer model to study the social interactions between college students. In this model, we will use the exchange of available social hours between friends to study the interactions between friends. From this study we will look to find how well college friendships help students to distress, how long college friendships typically last, and the optimum number of friends to have." Nicholas Schmidt '14 worked with Professor John Vaughn on an Honors in Computer Science. His project, "i3: An Environmental Sensor Base Station," is described as "My honors project is in two parts. One is creating a weather base station that collects weather and sensor data. The second is a mobile application that shows the collected data to the user. The base station is cube-shaped and the mobile platform will be iOS." 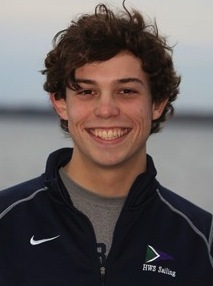 John Darby is a double major in computer science and architecture and is a member of the HWS Sailing team. His idea for the pitch arose partly from an independent study that he did in web site programming. John will attend graduate school next year in the architecture program at the University of Pennsylvania. The Stu Lieblein '90 Pitch was held for the third time this year. It was established to promote entrepreneurial leadership and is organized by the Centennial Center for Leadership of Hobart and William Smith Colleges. The John S. Klein Prize, awarded to a graduating Senior to recognize excellence in Computer Science, to Alexander Kittelberger H'13. The Irving Bentsen Prize, awarded to the second year student at Hobart College who has the most outstanding record in mathematics and computer science, to Ruiqian (Richard) Dai H'15 and Luke DeLuccia H'15. For more about student prizes in the Department of Mathematics and Computer Science, visit our department prizes page. Alexander Kittelberger H'13 has completed an Honors project with the title, Online Virtual Math Museum: Building a Virtual Math Museum with Modern Web Technologies and an XML Infrastructure. An Honors project is a year-long endeavour culminating in a long Honors thesis and an oral examination by a committee of three examiners. Alex's Honors Project was to create a website for mathematical visualizations. From equations to geometry, there are many different types of mathematical objects that can all be described in different forms. The “Online Virtual Math Museum” is designed to store and present information about mathematical objects in the form of a website. An XML language is used to define these mathematical objects, and a Java program is used to create webpages to present the objects visually. For this project, a framework was developed for a website that can display different mathematical objects. The framework can easily be extended and allows programmers to expand on the presentations. Alex's advisor for the project was Professor David Eck. 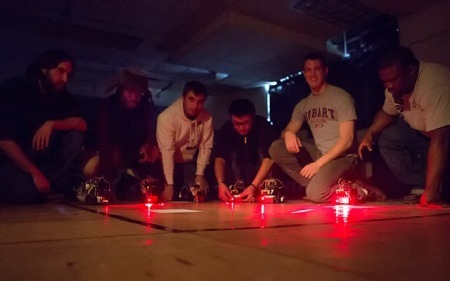 Here is a picture from a "laser tag" project in Professor Vaughn's Robotics course (CPSC 336). The first project in that course in Spring 2013 was for each student to build and program a mobile robot to play laser tag. Each robot was equipped with a low power laser, laser detector, and infrared obstacle detector. Any robot hit by an opponent's laser was required to leave the arena. Each behavior-based robot was individually programmed with a strategy to apportion its limited power resources for lasers, movement, or general health. The contest was held in a darkened arena to maximize the laser effects. Students in the photo, from left to right, are: Kieran Koehnlein H'13, Kingsley Adarkwah H'13, Sam Heine H'13, Ruiting Wang H'14, Mark Benya H'14, and Chazoi Hardware H'13. Trevor Gionet (H'12) has been awarded a Fulbright English Teaching Assistantship for study in Vietnam. In addition to teaching English, Trevor will take Vietnamese language lessons focused on mathematics. With this, he hopes to be able to teach math bilingually. The Fulbright Program was established by the U.S. Congress in 1946. The purpose of the Fulbright Program worldwide is "to increase mutual understanding between the people of the United States and the people of other countries by means of educational and cultural exchange." The U.S. State Department's Bureau of Educational & Cultural Affairs (ECA) is the principal administrator of the Fulbright Program. Bi-national commissions, composed equally of U.S. and partner-country citizens, coordinate Fulbright Programs in fifty-one of the 140 participating countries.